The iPhone X dropped last week to scores of salivating consumers and, with its release, came a faster, f2.4 aperture telephoto lens and dual optical image stabilization that is drawing favorable video comparisons to footage shot on professional mirrorless cameras like the Panasonic GH5. On top of those features, the iPhone X, as well as the iPhone 8 and 8 Plus, will now be able to shoot 4K video at 60fps and slow-mo video in 1080p at 240fps. All of this is sure to continue iPhone’s legacy as the go-to choice for professional and amateur videographers due to its impressive ability to take quality videos on the move and without the bulky equipment. And when paired with a mobile video stabilizer, also know as a gimbal, the footage can be truly top-notch—especially with a little work in post-production. Indeed, shooting mobile video is notoriously plagued by shaky footage which is pretty much unavoidable. Sure, some post-production video editing suites can remedy this to an extent and the iPhone X has the new built-in dual optical image stabilization, but, without a video stabilizer, producing quality, smooth video clips will be a huge uphill battle. With all that being said, purchasing a gimbal for your iPhone X, 8, or 8 Plus comes with loads of choices and factors to consider like price, quality, size, and durability. 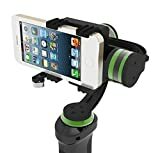 But what is the best Gimbal for iPhone X, 8 or 8 Plus? The DJI Osmo Mobile is a 3-axis camera gimbal that sets the benchmark for quality when it comes to mobile video stabilizers. DJI, mostly known for their ultra-popular drones, produced an easy-to-learn iPhone gimbal that will maintain smooth footage regardless of bumpy shoots or vibrations. The DJI Osmo Mobile is decked out with tons of features including active tracking of targeted subjects, motion time lapse, detailed panoramas, and livestreaming capability. The DJI Osmo package also comes with a bunch of additional accessories free of charge. The main downsides of the popular gimbal are its sometimes buggy app and a noticeable bobbling effect at times. Although it carries a somewhat heavy price tag, this is the by far the most recommended mobile video stabilizer on the market by vloggers and professional videographers. 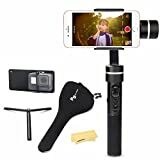 But if you are a beginner on a budget, this might not be the right mobile camera stabilizer for your iPhone X or iPhone 8. Motion time-lapse videos are an awe inspiring way to show the passing of time. Share moments using YouTube Live inside DJI GO when mounted in the Osmo Mobile. Take 1-second long exposures for light trails and dramatically blurred cars without a tripod. A cheaper choice than the DJI Osmo Mobile, the Zhiyun Smooth II is also a highly recommended mobile video stabilizer by professionals and amateurs alike. This 3-axis gimbal stands apart from the pack with features like complete 360-degree rotation, remote application, a smart-face track option, a five-way joystick, a five-hour battery life, and the ability to charge your phone while still in use. But the Zhiyun Smooth II most stands out for its super noise reduction technology that promises to always provide for steady, smooth shots, no matter the conditions. The most cited downside of the Zhiyun Smooth II, however, is its lack of detailed instructions for beginner users. The Zhiyun Smooth II is compatible with all mobile phones with under 6-inch screens including the iPhone X, 8, and 8 Plus. Offers Full 360 Degrees Rotation Along the Pan Axis, and comes with a 5-Way Joystick to adjust your angle accordingly. Supports wireless control via bluetooth by using the Zhiyun app on iOS or Android devices. Also supports the Zhiyun Remote for remote pan and tilt functionality. Average 5-Hour battery life (your battery life may differ). Charging your phone while using the gimbal is also supported (audio jack may not be accessible on all phones after mounting). 1/4"-20 Mounting Thread on the bottom of the gimbal supports any 1/4" threaded accessories, such as extension rods or mounts. Embedded with Reverse Circuit Discharge Protection, which prevents the gimbal from malfunctioning if the motors are over-strained. Another often recommended mobile video stabilizer is the LanParte HHG-01, which is not only suited for mobile phones including the iPhone X, 8, and 8 Plus but also works great with GoPros. The most notable features of the LanParte HHG-01 is its great gesture control, durable housing, non-slip grip, auto-calibration, and long battery life. One common complaint about the LanParte HHG-01 is that it doesn’t feature a joystick mechanism but just simply follows and adjusts to the motion and movement of your wrist to smoothen shots. So while it’s a cheaper alternative, the LanParte HHG-01 doesn’t offer quite as much range and customizability of shots like the gimbals mentioned above—which might not be such a bad thing for beginners. The FeiyuTech SPG, a relatively cheap gimbal option, is a steal considering the quality tech, lightweight design, ease-of-use, and 8-hour battery life. The FeiyuTech SPG connects to a user’s phone via Bluetooth and the small handle features joystick and other buttons that makes taking seamless and smooth videos a cinch. 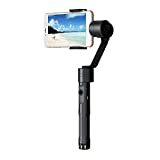 What’s even more, the highly recommended mobile video camera stabilizer has a sliding arm mechanism that makes it easy for videographers to find the center of gravity, an especially helpful aspect for beginner gimbal users. The FeiyuTech SPG has the ability to pan 360-degrees and tilt 320-degrees and its small design makes lugging it around all day an afterthought. SPG with plate: it allows the gimbal can not only compatible with Smartphone like iPhone, but also with GoPro 6/5/4 Cameras. Splash proof Design: The upgrade version of spg achieves the splash proof function, which enables you to make more fun without fear of rain or water ingress. Has power-intense ICR 22650 battery: Feiyu SPG offers 8 hours stable work duration for your long time outdoor work. Also available for you to have real-time charging by using power bank. This solid mobile video stabilizer was built with outdoor lovers, adventurers, and athletes in mind. Despite its ultra-lightweight design, the Steadicam Smoothee can eliminate nearly all of the shake, noise, and vibrations from mobile footage and the quality doesn’t falter when filming action movements. Among the Steadicam Smoothee’s key features are an impressive stabilization system and an adequate balancing mechanism. The Steadicam Smoothee’s durable metal grip will allow any iPhone X, 8, or 8 Plus user to get great footage in even the most rugged locations. The two main downsides are its steep learning curve and its expensive price tag.